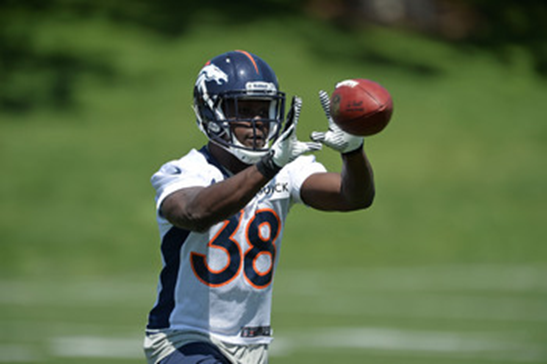 Neil Cornrich & NC Sports, LLC: USA Today names Montee Ball one of NFL's "Rookies to Watch"
USA Today names Montee Ball one of NFL's "Rookies to Watch"
Rookies are part of the NFL's fabric, and their impacts on their new teams is often significant. USA TODAY Sports' Nate Davis highlights one per club worth watching in 2013.) EJ Manuel, Bills: He was the only quarterback taken in the first round of the 2013 draft. Manuel only needs to beat out Cardinals castoff Kevin Kolb (4) to earn the starting job in Buffalo's first season under new coach Doug Marrone. Matt Elam (pictured) and Arthur Brown, Ravens: Elam (Round 1) and Brown (Round 2) have the enviable tasks of taking over for FS Ed Reed and ILB Ray Lewis, respectively, veterans who have moved on amid paths likely to end in Canton. Baltimore’s defense may or may not be better in 2013, but it will surely be faster. Le’Veon Bell, Steelers: Pittsburgh only ran the ball 412 times in 16 games in 2012 (20th in the NFL) while Bell carried the rock 382 times in 13 games for Michigan State. Look for him to be the man to revitalize a once-formidable ground assault. Montee Ball has a good chance at taking over as the Broncos’ lead running back. Montee Ball, Broncos: Denver didn’t have many weaknesses in 2012, but an inability to milk the clock in the postseason helped lead to the stunning ouster by the Ravens. With RB Willis McGahee now on the street, look for second-rounder Montee Ball to emerge as the bellcow -- provided he can handle pass protection in front of QB Peyton Manning. Tavon Austin, Rams: Expect St. Louis to get creative in finding ways to put the ball into the hands of Austin, who caught 114 passes for 1,289 yards and rushed for 643 yards last season at West Virginia. He should also get a shot to produce as a returner and seems to already be on the rookie of the year short list among preseason prognosticators. Tyrann Mathieu, Cardinals: Is he a corner? A safety? A returner? A Honey Badger? He's distancing himself from the infamous nickname even as Arizona asks him to embrace a hybrid safety/nickel role in the hopes Mathieu can make the game-changing plays he produced for LSU in 2011. And he might give former Bayou Bengal teammate Patrick Peterson (21) a rest on special teams, too. Cordarrelle Patterson, Vikings: He’s one of Minnesota’s three Round 1 choices (the first time a team has had such a trio since 2001). Though Patterson's receiving skills need polish, defenses will have to respect his deep speed. Even if he doesn't make an instant impact for QB Christian Ponder, look for him to make his presence felt as a return man. Eddie Lacy (pictured, 27) and Johnathan Franklin, Packers: Green Bay has never ranked better than 14th running the ball since QB Aaron Rodgers replaced Brett Favre in 2008. Yes, the team has clearly fielded offenses that shock and awe, but the arrival of the rookie runners could provide balance that's frequently been lacking, especially at playoff time. Zach Ertz, Eagles: While at Stanford, the tight end caused plenty of headaches for former Oregon coach Chip Kelly. Now they've joined forces in Philadelphia, and Ertz could quickly emerge as one of the weapons in Kelly's highly anticipated offense. Manti Te’o, Chargers: All eyes in San Diego will be on the headline-making linebacker this season. Can he hold up against speedy AFC West RBs Jamaal Charles and Darren McFadden? Will he get abused in coverage by Peyton Manning and others? Will he be embraced by his teammates? Stay tuned (but also keep an eye on T D.J. Fluker and WR Keenan Allen).